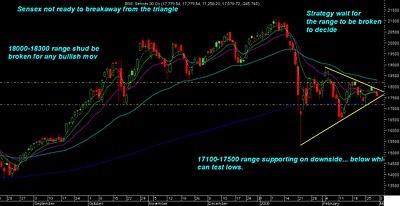 Sensex could not cross the crucial levels of 18100-18200 the upper side of the triangle. So the possibility of breaking the triangle on upside for a fresh bullish move is out of the picture for some time. 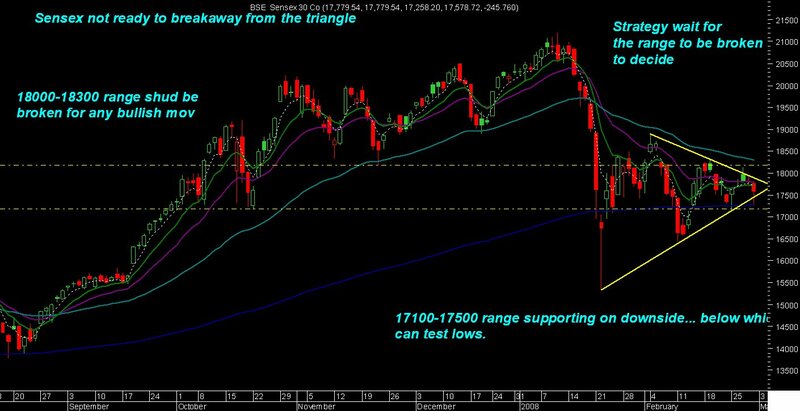 On the lower side 17200 -17500 zone is a band which is supporting and closing below those levels or sustains below 17100 would mean a breakout of the triangle on lower side and markets should test 16500 , 15800 levels . Strategy would be to wait out for a breakout on either side in the next 2 weeks as the indices still dont seem to be decided for a clear directional move. Investors can continue to hold cash and wait for better opportunities if markets correct below 17200 as there would be good value levels in certain stocks. If that doesnt happen wait for the mkts to clear 18200 so that would mean a clear move and long term commitments can be taken comfortably . Many of the stocks apart from the Index stocks look very attractively priced and good returns can be seen from current levels for investors with 6 mths to 1 yr horizon. But one thing important in investing is to be comfortable and convinced of the possible upmove and that would come only in a stable and trending market which currently is not . So if a stock can be available at gr8 levels in case of a further correction and then the investor would definitely be convinced of never getting such a gr8 value buy and would be ready to add at every further dip from there on. Thats the reason have been advising a wait and watch strategy as fresh buying in attractively priced stocks now is a good thing but the holding period will be longer and an investor doesnot like to see investments languish for a long time and would test the patience and maybe one would exit early in case of rise. Ranbaxy does 458 near to our tgt of 460 and have advised booking fully and wait for 465 close to see a fresh move. RANBAXY book fully at 454-458 . Fertilizers stocks as had said before that exit on budget day and the wordings were buy on rumours sell on news and we did see good 10% move frm our buy levels. We did lose 40 points on nifty futures buy trade.